As of the 2010 census, there were less than 5,200 people who called this community home. Of course, it only includes 1.4 square miles of land. 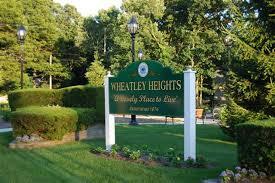 Although there is no direct beach access, Wheatley Heights offers stunning views of the Atlantic Ocean and Great South Bay from the homes located on the winding hillside roads. Several buildings and homes are on the National Historic Registry.